Hot Tail is a fun little â€œforward runnerâ€. Harold is an Ibex. Escaping moments before being sacrificed to a massive fire demon, his tail alight from the close call, he know runs for his life. The player must dodge rocks, piles of skulls and other paraphenalia while avoiding the fireballs of the demon chasing them. A â€œforward runnerâ€ is a term I made up, it simply means the player character is running towards the camera. The screen shots and game play video below make it clearer. 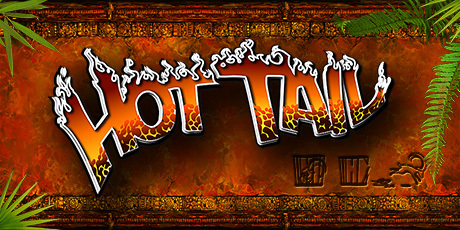 Hot Tail was the first game I made â€œprofessionallyâ€ and it was actually started while I was still a student. I began an internship with Valhalla Studios (now Bifrost Studios) as a part of my degree. They had an idea for a mobile game and needed a coder. So, with no experience making applications for mobile, no experience using a mac and no other coder on the team to assist me, I threw myself into figuring out how to make this game. The artists had already started making assets with no guidelines other than some loose, self imposed limits (which were wrong). I hadnâ€™t even left college yet and I was already facing one of the biggest challenges Iâ€™ve come up against yet. Itâ€™s not the most polished game on the market. The art style went through a number of hands and a number of changes due to technical limitations we discovered as we went. It was my first attempt at using Unity, and my first time as a member of the â€œdesignâ€ team. The amount Iâ€™ve learnt since this project still surprises me. I could confidently recreate this game in a few weeks, much more polished and much more fun. In fact I still maintain the idea is a solid one. nearly three years on and I still havenâ€™t seen another forward runner on the store.